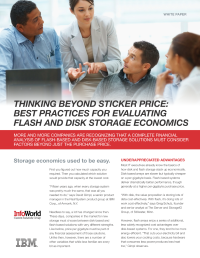 More and more companies are recognizing that a complete financial analysis of flash-based and disk-based storage solutions must consider factors beyond just the purchase price. Storage economics used to be easy. First you figured out how much capacity you required. Then you calculated which solution would provide that capacity at the lowest cost. Needless to say, a lot has changed since then. These days, companies in the market for new storage must choose between disk-based and flash-based solutions with very different strengths. Like before, price per gigabyte must be part of any financial assessment of those solutions. Unlike then, however, there are a number of other variables that while less familiar, are every bit as important.